Will Averages Begin to Catch Up for California? Are We Experiencing Man-Made Global Warming? After four years of drought, most of California is under a water emergency. However, we are seeing indications that at least some relief is in sight for the short run and the long run. First, let's get some facts straight; California is mostly a desert. The drought stricken areas along the southern coast are deserts that have been radically over populated by man. We have decimated the geography by covering it in concrete and planting thousands of different varieties of non-indigenous plants. We have polluted the air and ground. In short, man has not been good to this area and there is no argument for that. The weather in this area is so nice in both the winter and summer that it is a very highly desirable place to live. Extended dry periods in deserts are not that uncommon. However, when you have over 30 million people living there they tend to be catastrophic. The San Francisco Bay area is not much different. It gets more annual rainfall (on average) than Southern California, but man has raped the land by putting 10 homes where there should probably be one. Again, concrete abounds and so does the air and water pollution that follows man wherever he goes. So the question that is on everybody's mind is this; Has man destroyed the earth's climate, especially in places like California and other highly concentrated population areas? Many scientists believe that the answer to that question is a resounding YES. However, other scientists believe there is no connection. Believe it or not, we only inhabit 2.5% of the planet. We have only had combustion engines around for about 80 years and perhaps 50 or fewer years have those engines been prevalent. Add to that wild climatic change has been documented long before man arrived and you can see, at very least, there is uncertainty no matter which side of the argument you are on. Here is a wild coincidence; Volcanoes release primarily 3 gases. They are water vapor, Carbon Dioxide and Sulfur Dioxide. The levels of these 3 gases depend on the volcano. They can differ greatly. Conventional wisdom is that the Sulfur Dioxide is the worst gas released in any quantity for our atmosphere (Sulfuric Acid). Coincidentally, Carbon neutralizes SO2 and many other harmful chemicals. It has been called the great cleaner of the atmosphere. However, atmospheric Carbon levels are now much higher than they have been in the past. It is believed, this is due to the combustion engine exhaust and other carbon omitting, man made practices (coal burning power plants, etc). So, what will be the result of these elevated carbon levels? Nobody knows. But most believers in man made global warming point to this as the culprit. So there you have it. What do you believe? Myself, I have no idea. I do know that every time man goes to solve the problems of the earth, we make it worse. Certainly, you have read past blogs documenting the money being spent on researching man made global warming. The true GW pioneers fly around in their Gulf Streams and drive around in their limos and release more atmospheric carbon than 1,000 average folks; so how concerned are they really? What is the solution? Let's assume for a moment that man is killing the planet by emitting too much carbon into the atmosphere. How do we solve that problem? Do we stop driving? Do we pass a law that forbids driving? That seems a little unrealistic. How about we only drive cars that emit no carbon exhaust, like an electric car? Of course electric cars use batteries. Batteries are pretty much the most offensive substance that man has come up with in respect to harming the environment. Also, let's not forget that those batteries need charging. In order to charge them we need electricity. Like the kind that comes from coal burning power plants. In addition, how about emerging economies like China and India, are they going to abide by our laws? In a word, NO. In short, there is no solution or at least none that I have ever heard. However, remember that we are not even sure there is a problem. Averages. Weather cycles work on averages. They also trend, for very short periods of time (50 years) or long periods of time (1,000 + years). Therefore, to say that this four year drought in California is a statistically significant trend that will continue, is probably an incorrect statement. Most rational scientists believe that any harmful effect would only be seen in the longer term trends. Certainly, the weather and climate of the future cannot be predicted based on the last 4 years. Also, we are talking about California, there seems to be other drought stricken areas but probably just as many areas that are experiencing well above average precipitation (Ask the rest of North America). Enter El Nino. Last year most long term weather forecasters were calling for a moderate to strong El Nino (at TWB we did not agree with these forecasts, too much variability). You know the rest, El Nino fizzled and we had another dry year in California. Things look very different this time. TWB believes we are going to have a strong El Nino by October that could last through the entire rainy season in California. Believe or not, this could bring more catastrophic weather to California as the short term averages begin to catch up. We have often warned our readers about forecasters who use the word "normal". There is nothing normal about weather and climate in general. Chances are, this machine we call earth and how it operates is so far beyond our comprehension that we have not even scratched the surface when it comes to understanding the many interdependent variables at play. Here is what we do know; In the past we have only had 2 El Nino's as strong as the one TWB believes we are looking at for Q4 2015 and Q1 2016. Yes, this is a very small sample size. However, the rainfall anomalies for California were great. Also, the timing for this El Nino looks near perfect as it will be at it's strongest during the rainy season. 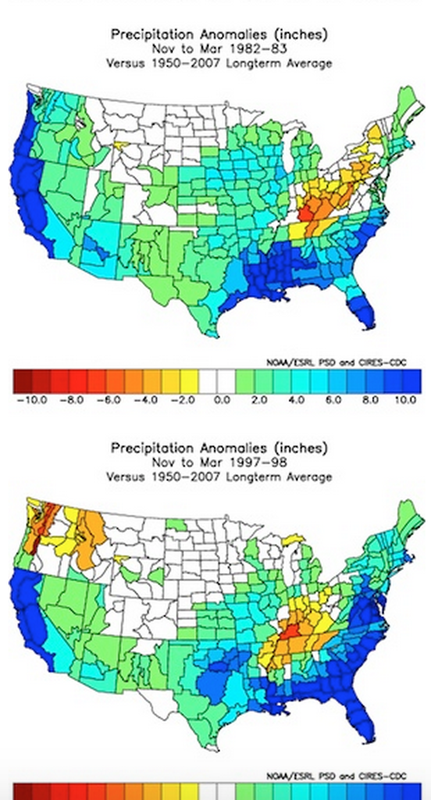 The following maps show the effect that El Nino has had in the past. If we were to look at moderate El Nino's, the number are also similar but not quite as radical in rainfall increases. In the images above, this strong El Nino had a tremendous impact of precipitation totals, especially in the state of California, especially in the areas hit hardest by drought, those areas that have been over populated by man. This greatly increased precipitation caused flooding on a massive scale, mud slides, land erosion and many other problems, including dangerous snow depths and other Sierra related problems. Remember that this is a very mountainous area. When it rains in the mountains that water goes down and down is where most of the population lives. So by all accounts we are looking at a very rainy winter of 2015/2016. How rainy? That is impossible to say. Will NOAA declare that the drought is over for California? Almost certainly not. With the abundant populations of the areas hit hardest by drought, I doubt NOAA will ever declare the drought over. In addition, our sample size for moderate to strong El Nino leaves us a relatively high p-value. In short, a statistician will tell you not to trust the trend, there is not enough substantial data. We have already seen anomalies in our weather caused by this El Nino, including rain in the middle of the summer in the desert west. I look for that trend to continue. When the heavy rains come, many may regret what they wished for. Regardless, it will not settle the man made global warming debate. I BELIEVE the weather is being messed with by man! Who, i can not say, but, i do wish the MEDIA was not being threatened in order that they may admit their TRUE beliefs, and allow WE THE PEOPLE to know the weather as They see it! I am sure that this will NEVER happen, so my consultation is that GOD Has The FINAL ANSWER, and WE THE PEOPLE should take solace in that! "DAMN" those who mess with GOD'S Green Earth! I am not convinced that man can mess with God's green earth. Even when we try to fix it and screw it up, the system recovers. Without doubt the system will recover. The questions that remain are, how long will it take and will humankind be around when it does. Not the end of the world, just the end of us!